You won’t miss the Benihana sign. 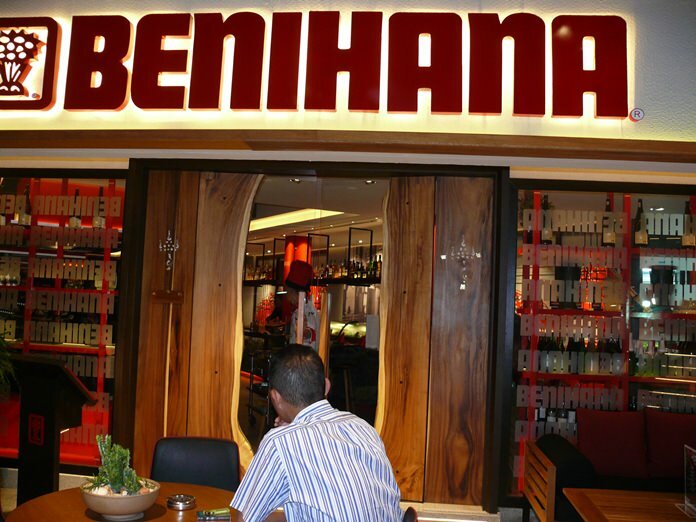 The Benihana restaurant has been on the second floor of the Royal Garden Plaza for a number of years. Whilst a very popular dining venue, it was really a bit out of the way, tucked in the corner. 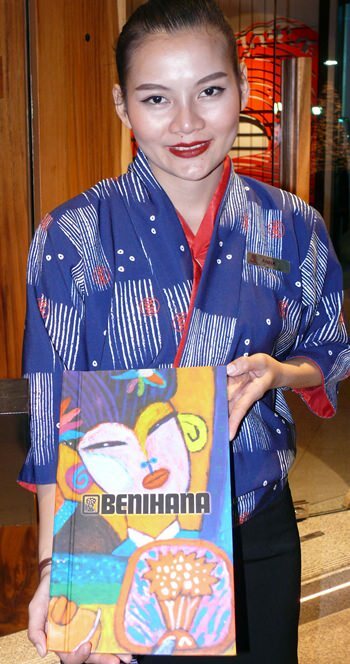 With it now being under the Avani management, the decision was made to make Benihana more “diner friendly” by relocating to the first floor on the ocean side of the center. Having made that decision, the problem was then to find space to be able to house Benihana. That step was a masterful triumph of architectural planning, converting the stairs from the first floor into a cocktail bar, plus a pleasant relaxing area overlooking Beach Road, plus the new enclosed Benihana booths and Teppanyaki kitchen. The meeters and greeters put you in the right mood for an enjoyable evening and we took the advantage of a breather before dinner while sitting and watching the mad world of Pattaya going past beneath us. I had a glass of Asahi to settle the stomach (even though it isn’t made in Japan. You can say the same about Heineken). We had booked one of the glass enclosed areas for six. There is another for 12 people if you have a large group. 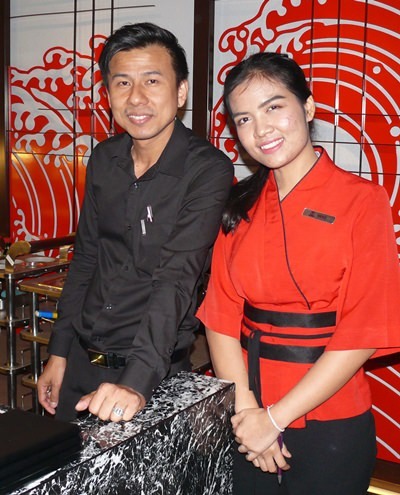 The Teppanyaki hot grill is between your chef and yourself, but can get quite busy with grilled offerings flying about like prawn tails into the chef’s tocque, along with salt and pepper canisters. There are numerous appetizers (B. 220-550) and includes tempura prawns, and tuna tartar with Miso wasabi and crispy lotus root. The main dishes are not cheap, but you are getting a show at the same time. 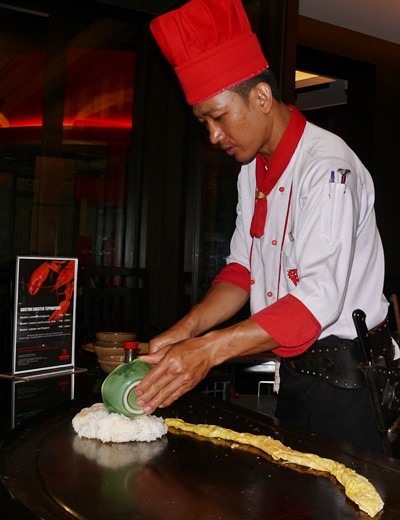 For example the Benihana Pattaya dish features shrimps and Australian teriyaki beef striploin (B. 1150), through to the Shogun’s Feast with Tiger prawn with lemon butter and Kagoshima Wagyu rib eye with grilled mushrooms. There is even a 1 kg Tomahawk steak grade 4 (best to share) at B. 4,400! However, there is a Prawn Miso Udon Noodle, for example, for those with long pockets and short arms B. 390. Benihana is much more than a fancy Japanese restaurant. 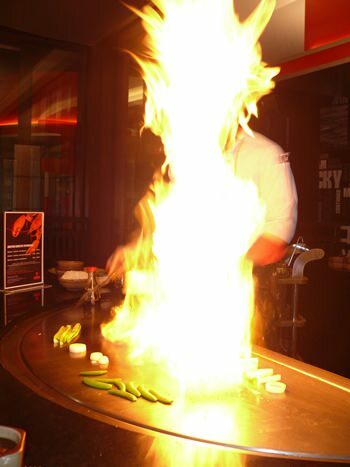 It is an entertainment venue, revolving around Japanese cooking and involving the diners. Our chef (K. Shake) kept us amused and laughing with his antics, whilst at the same time presenting us with well cooked food (and the service ladies kept the Stonefish Chardonnay topped up as well). This is an ideal venue to take overseas friends and relatives, and your family for special occasions. Highly recommended. Benihana Japanese Restaurant, Avani Resort and Spa, Beach Road Central Pattaya, secure parking in the Avani Car Park (but do remember to get the parking ticket stamped before leaving). 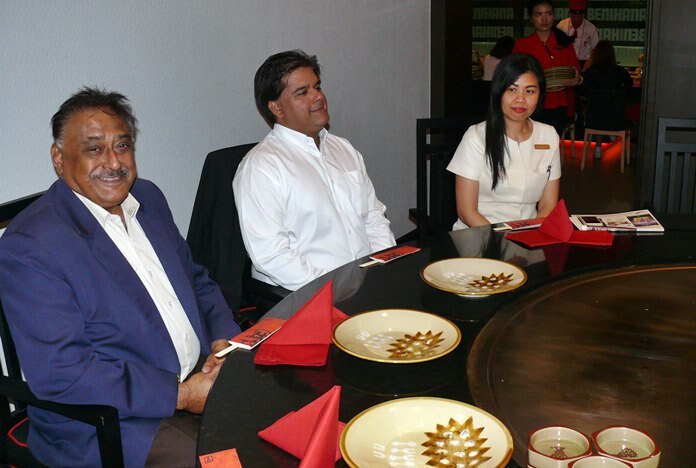 Benihana the Japanese Steakhouse, Avani Pattaya Resort and Spa, 218/2-4 Moo 10, Beach Road, Pattaya, plenty of parking in the car park in the basement, tel. 038 412 120, email [email protected]. Service staff with a smile. Chef Shake making an egg snake! The Dining Out team ready.